I have turned the heel on the Coco Kiss sock. It has been such a long time since I have turned a heel that I was completely shocked that I could do it! It is an amazing thing this turning a heel. I never thought I would like knitting socks. I very rarely wear them. My feet are just too hot to wear them. I like knitting them, though. 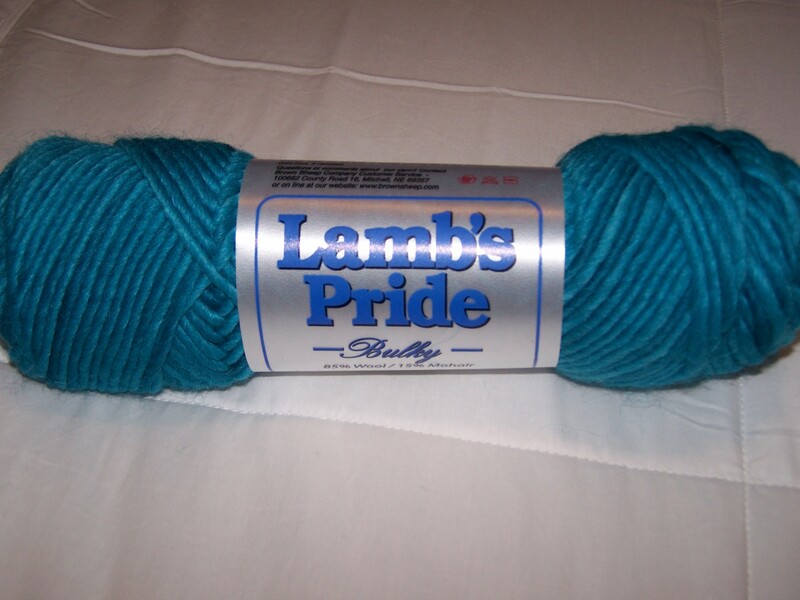 They are very easy, portable and the yarn is great. At least Smooshy is great. I am loving this color, too. It is called Coco Kiss; however, it is really a combination of a rich chocolaty brown, a smoky gray and a deep charcoal gray. It stripes but not an in-your-face stripe. It is more a subtle color shift. It is great, and you should run to your LYS and touch it, smell it, oh, go ahead and fondle it. Good, right? 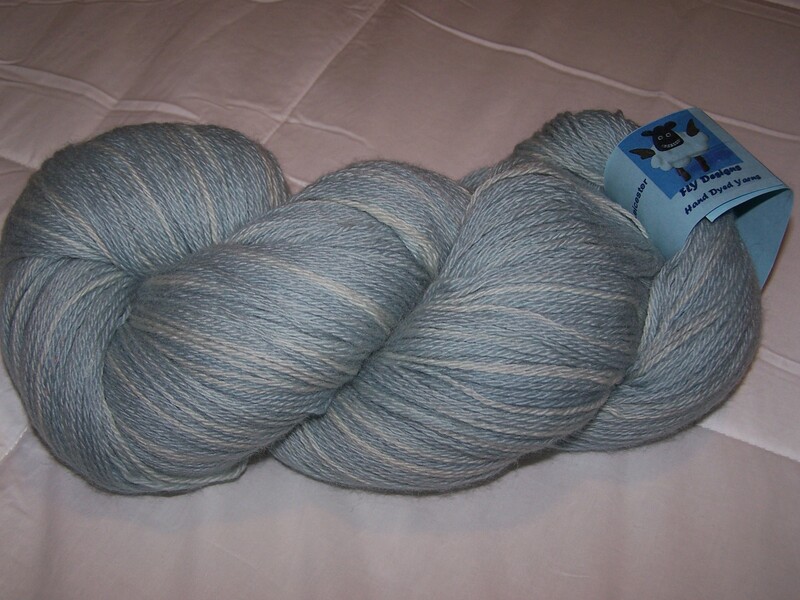 I know I am going to love working with this yarn. It is so very soft. And pretty. It is oh so pretty. I can not wait to start. Speaking of starting new projects, I want to start about 10 new sweater projects. I don’t, however, want to invest in a project that will take gads of time. Hence the socks and baby stuff. 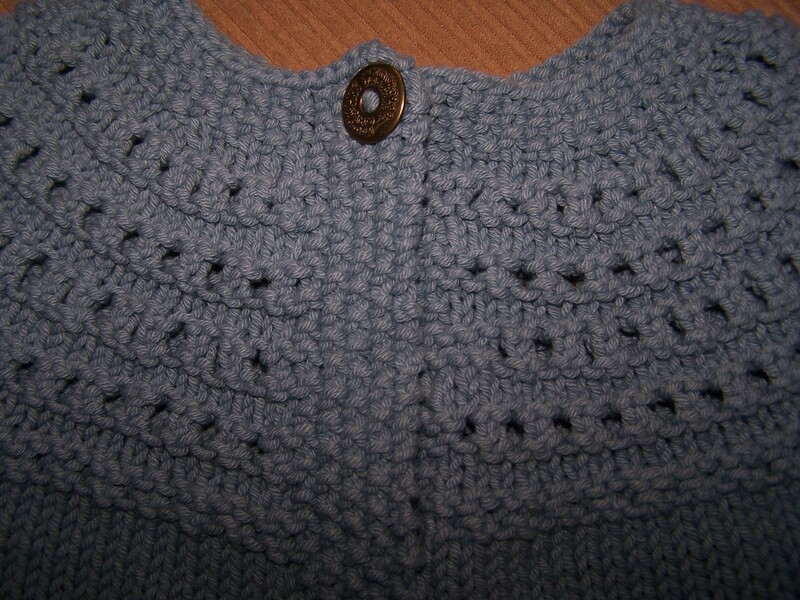 Though if I keep reading Jared’s blog I will start a new sweater soon. His stuff is beautiful. He is actually making me want to design my own sweater. We’ll see. This has been a very busy and hectic week. I think for this catch-me-up post, here is my photo essay …. 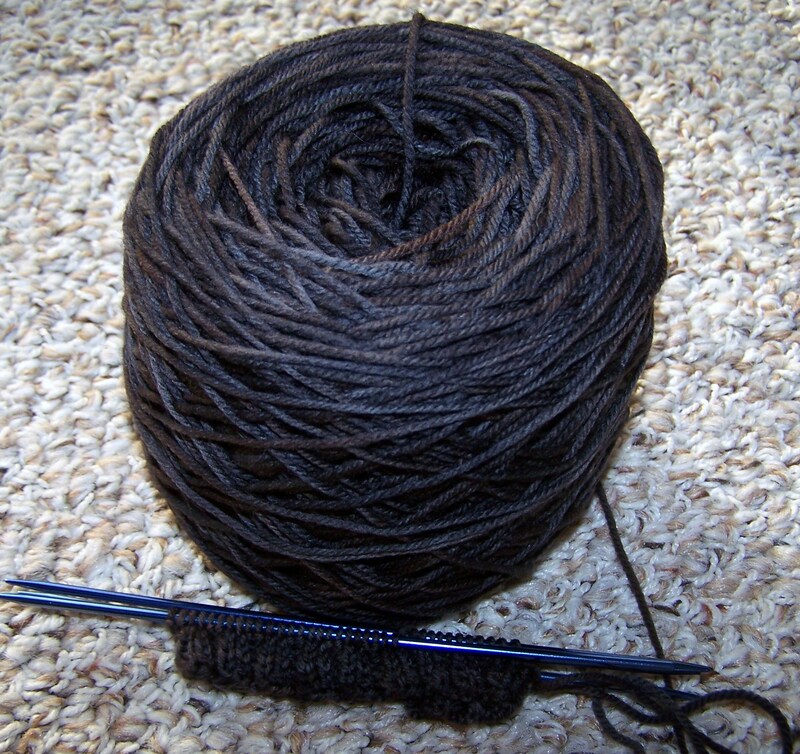 Lorna’s Laces in Black Purl socks, waiting for their heels to be turned. Dream In Color Smooshy in Coco Kiss, just started sock. Birthday present from bosses – new knitting bag. with 6 pockets for all kinds of yarn goodness. 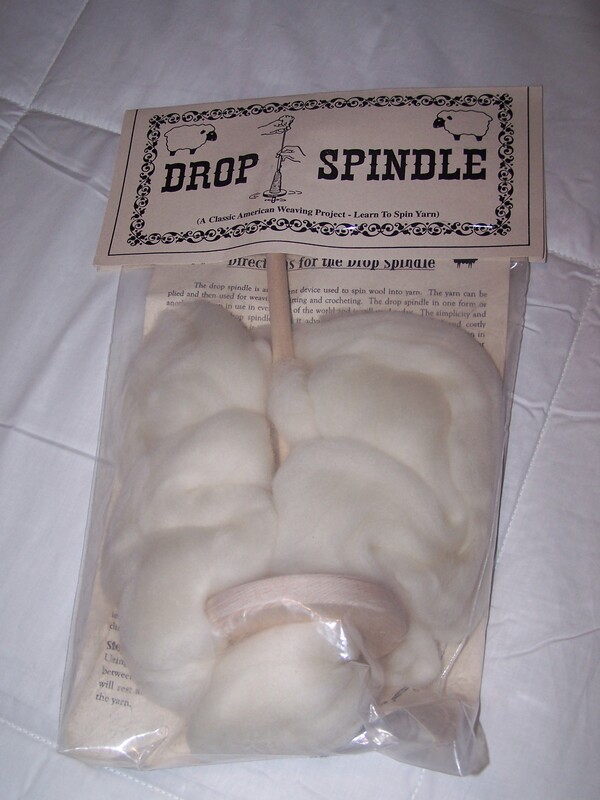 It is my very first drop spindle! He said this is so I can make my own yarn. I’m not sure I have ever loved my son more than this moment. 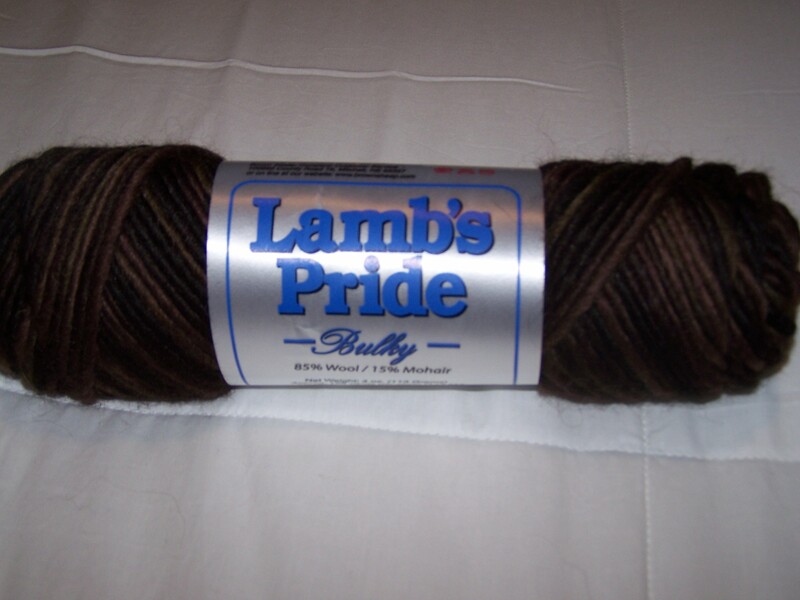 He loves me so much that he, without me hinting or asking him, selected a fiber related gift. My boy is growing up! I am so happy! 2. 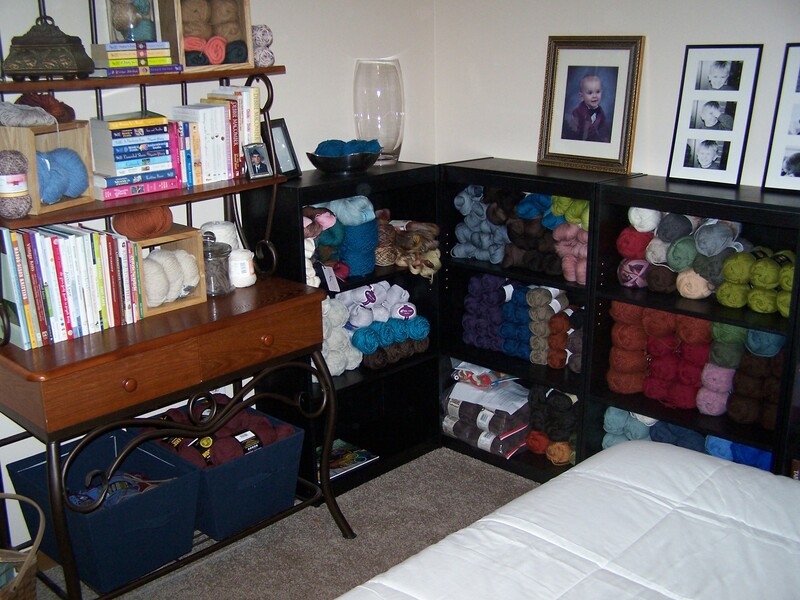 After weeks and weeks of work, I have finally finished my very own yarn room! And before you ask, yes, this is all of my stash. Even this much freaks Hubby out. 3. 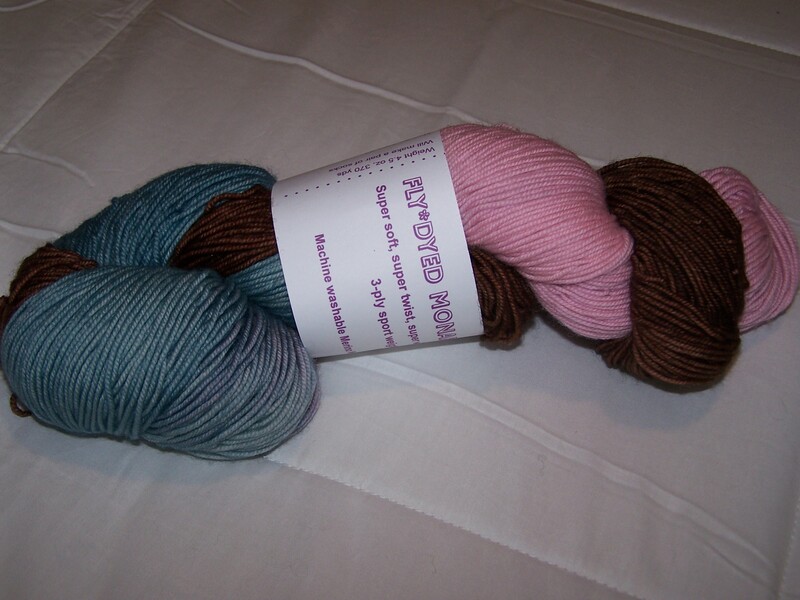 This is the Birthday yarn I bought for myself. Please no drooling on my new yarn. I am having the best time! I thing my idea of turning 29 over and over again is a great one! Day four of my vacation is coming to an end, and I think I have worked harder in these days than I have worked all year at my job. How is that? Now, I have to be honest. I did not work at all on my birthday. However, the other three days, I have worked from basically sun-up to sun-down. Really, I am hurting in places I did not know I could hurt! But, for all of my (and my bestest husband) efforts, I now have a brand new front garden/yard, an extremely clean house, clean clothes and my very own yarn room. I will have photos tomorrow. Technically, it is not finished. Hopefully it will be complete by tomorrow. I am very proud of all we have accomplished in three short days. I love my house, but my plan to finish my shawl has gone a little by the wayside. Now that we have everything mostly done, I am hoping to finish the shawl up. I am liking this project again. I think I am going to miss it. After all of my complaining, I am going to miss it. However, I’m not sure I will ever knit it again. Maybe this is why I am going to miss it. Yesterday was my 29th birthday, and I had the best day! We went to church. This in and of itself was a good thing. Hubby usually has to work Sunday mornings. After that, we went home for me to play on the internets. We went to the movies. We saw Vantage Point. It was pretty good. I wouldn’t recommend seeing it after a meal, though. You might get motion sick. After a little napping and a little knitting, we went to dinner at Macaroni Grill. Now, Hubby doesn’t really like this place, so this was a very special occasion. But the way, if you ever eat there, please try the blackberry mint sweet tea. It was so good I am craving it right now. We also splurged and had the new three berry tiramisu. It was good, but I was thrown a little by the lemon flavor of the cake. No worries there. Hubby finished it off. But, the blackberry mint sweet tea? Oh my goodness! Great! Next, we went to the bookstore. I love going to the bookstore! I found a new-to-me book. I liked it, but I don’t know if I like it enough to buy it. 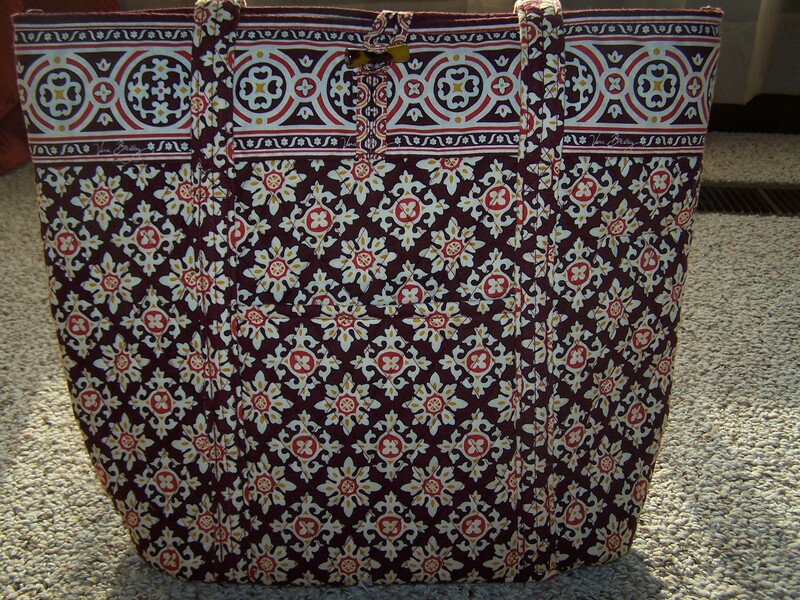 It is very frustrating to find a book that I like a few patterns, but not enough to justify spending the money on it. Especially since I have about 20 projects waiting for me to finish my shawl. This was a great day, facilitated by the bestest husband ever. The only thing missing was a visit to my LYS. However, it was Sunday, so it was closed. Besides, I have a bunch of new lovelies making their way to me right now. Yeah! This was the best last birthday ever! Today is the start of Five Facts Friday. Today is the start of my non-destination vacation. I am going to spend the time playing in the garden, knitting, spring cleaning the house (’cause it finally feels like Spring), knitting, finish up the guest room renovation, knitting, cleaning the boy child’s room, knitting. I am so excited I think I may pee my pants any minute. I love color. My favorite colors are peacock colors: blue, green, purple. However, I decorate my home in the colors of a Vermont fall: reds, oranges, golds. 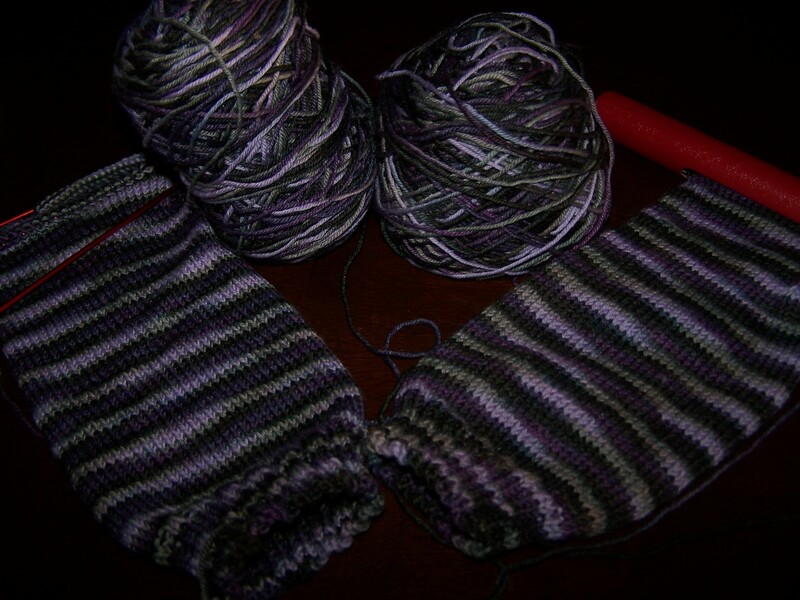 I think I am fostering a new addiction………..to knitting socks. I find it difficult to knit anything for myself. When I do, it is something quick and easy like a hat. Anything more substantial is either given away (first completed sweater which will be gifted this weekend), is not finished (sweater that is knitted but not sewn up) or never worn (scarves, hats, gloves). My birthday is on Sunday. That is the day that I get to do anything I want. It is a tradition in my house – on your birthday, you can do anything you want, within reason. Oh, and this is the last birthday I will have. Well, I will have the same birthday every year. I still want presents! 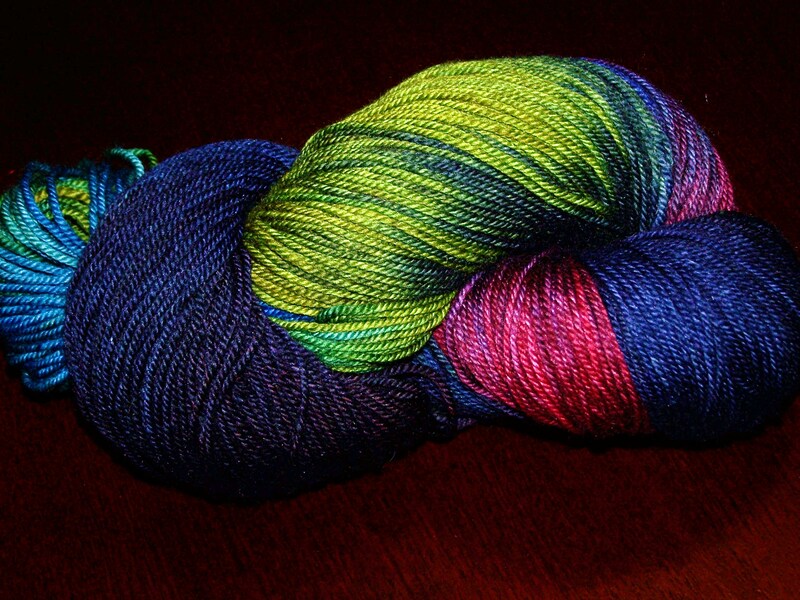 Birthday = yarn! 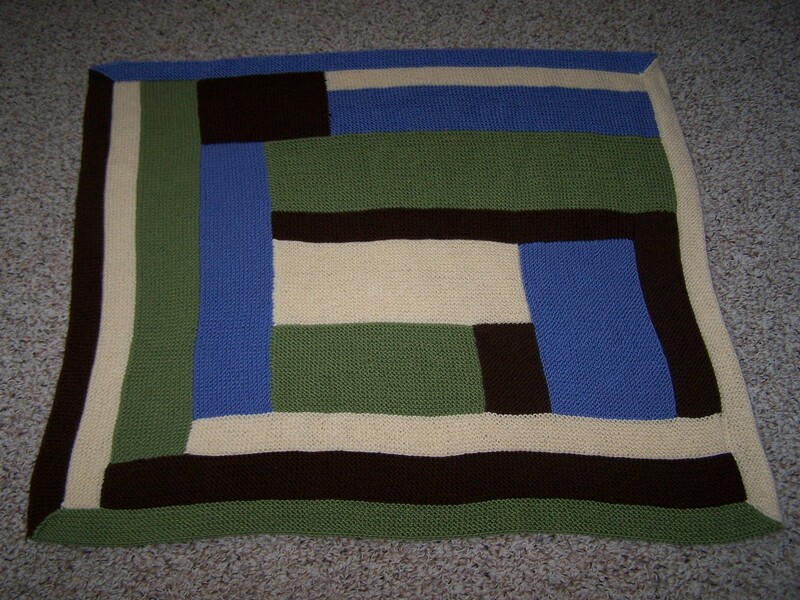 The Modern Baby Blanket baby will be born today. They went into the hospital this morning, and we are very anxious to here from the proud Papa. We know it is a boy to be named Noah. I love babies! Not much progress with the shawl. I have set a goal, though. I am taking this next week off from work for Spring Break. I am making it my goal to finish by next weekend. I think I am having triangleshawlitis. You start at the bottom of a shawl and it goes very very quickly. You are happy, thinking this was a good idea. It is so pretty and quick. Then, you get about halfway through it and realize the rows are getting bigger! Yup. It is a very tricky business knitting these shawls from the bottom up. It is like when you see the phone/internet/cable ads. Yes, you can have high speed internet access for just $19.99 a month. After you get all excited and start planning long weekends surfing the internet in the luxury of your own bed …. you find out that the $19.99 is only for the first 3 months, then the regular $69.99 a month kicks in. Or, you must also have your phone and mobile service with them as well. I tell you, it is a sham! It is the song that never ends…it goes on and on my friend. Do you remember that song from grade school? I used to sing it for hours just to annoy my parents. And my brothers. And my friends. Well, you know. Anyway, that is what this Candle Flame Shawl has become to me. It is the project that never ends. It goes on and on my friend. It is not that I don’t like the pattern or the yarn. I like both. I have other things I want to start, though. I do have to say I’m cheating. I started a pair of socks for knitting in morning and afternoon traffic. I am only allowed to knit it in the car. All other knitting times is spent on the shawl. I hope it will be done soon. 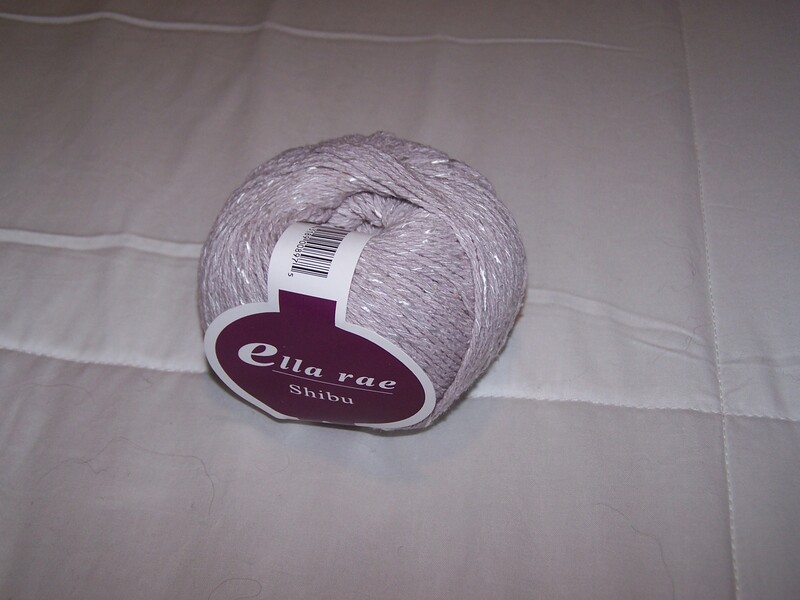 How long and wide should a shawl be? My birthday is this Sunday. This is the last year of my twenties. Sigh. Is your thirties rough? Anyway, take a look at the Meez –> That is what my dear heart will look like one week from Saturday. Hee Hee. We are going to my Mom’s house Easter weekend, so we will celebrate then. However, I got my birthday present from Hubby last night. I now can watch The Biggest Loser and NCIS on a brand new big screen TV! Woo Hoo! Well, technically, it is a combo gift for both of us, seeing as his birthday is next month. That is all I got. It is the shawl that never ends, it goes on and on my friend…………………………….. I love it. 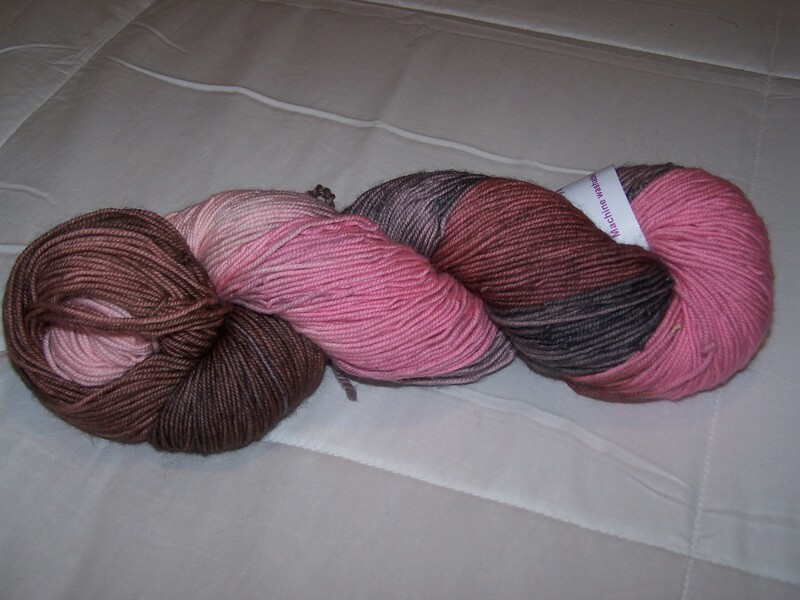 I think I am going to get rid of the yarn, though. I don’t like it. I also finished the baby sweater on Saturday. I really like how this pattern turned out. 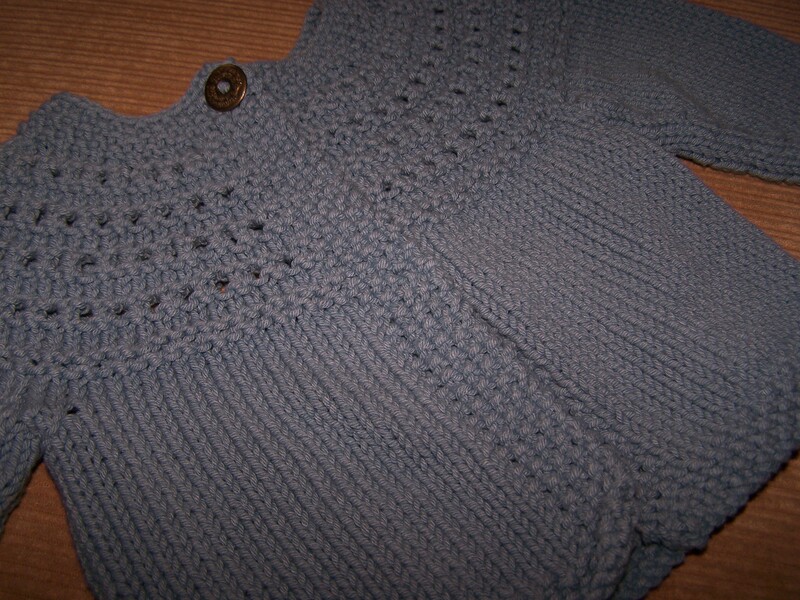 The bottom portion and the sleeves were knit flat and sewn at the end. Next time I think I will knit them in the round. I found it difficult to sew these seams. I like the yarn, though. I love anything that is machine washable for a baby. I love knitting baby clothes. I get to play around with new patterns without having to commit to a huge project. 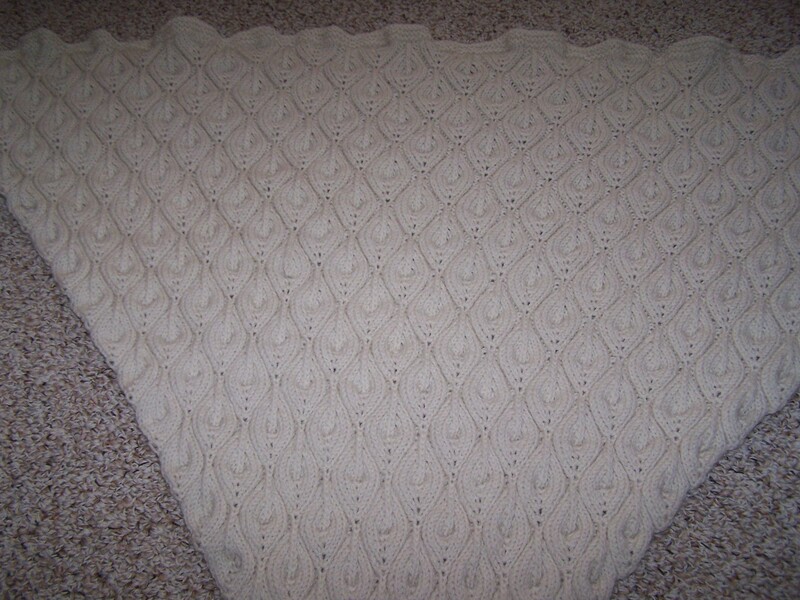 I am loving how the shawl is turning out; however, I am really, really ready for it to be over with. I guess this is why I have not one but two afghans sitting in baskets around the house. I also have a fully knitted sweater that is waiting top be sewn up. I really hate sewing up stuff. I guess I will have to stick with patterns knit from the top down. Now, I am off to play on Ravelry. I have been knitting for coming up on 5 years now. In all that time I have been a pretty solitary knitter. This in not strange to me, because I am a pretty solitary person. I like my own company and most of the time, prefer to be alone. (Except for my husband. Though, he knows when to talk and when to leave me alone, so it works out great.) Having said all that, I read all these other knitting blogs where people meet, start getting together to knit, go to fiber festivals together, and in general become life long friends; and I want that. I want the camaraderie of people who share a passion. While my dear, dear spouse tolerates my obsession with knitting and all things related, he does not share the passion. Today, I planned on marching right out of my comfort zone to attend a lunch time knitting group at Knit Nouveau. Well, I didn’t march but rather tiptoed. I packed up my knitting. I drove to the shop. I walked in the door. And I chickened out. I shopped for a little while. I talked for a bit. Then, Jane (I think it was Jane. I never did introduce myself. ), said that today was the lunch time knitting gathering. I smiled to myself and sat down to knit. I loved it. There was yarn and talking and knitting. New people came into the shop, and I talked to them too. It was fun. I am sure to go back next time. A lady came into the shop while I was there and said she wanted to learn how to knit. There were several people in her life that were having babies, and she wanted to knit for them. 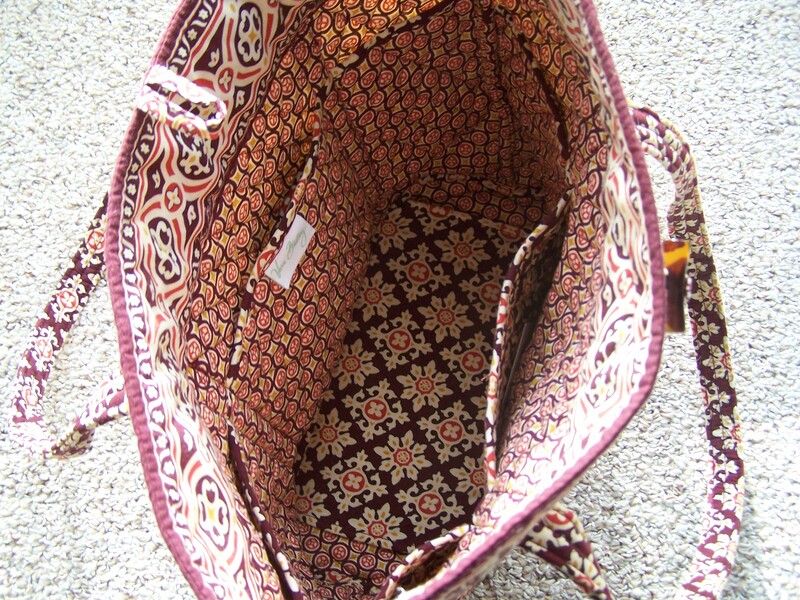 I felt the desire to share projects, books, yarn, and patterns that I liked and disliked. I wanted to help her learn and discover the greatness that is knitting. I think that is something very special about knitters. They want to help others discover their joy. That is what makes knitting so great. My son is starting his first “real” season of soccer. He has played the last few years in the Upwards program; however, it has not provided him a realistic idea of what competitive sports are like. It is work. He attends two practices a week and games on the weekend. There are people in the world who love playing sports. I dare to say that they tolerate the work of practices and training in order to play the game they love. They very rarely nurture new players. It is always a competition. Who can run the fastest? Who can score the most goals? If you make a mistake, you let down the team. There is little room to correct mistakes. There is so much pressure. I will admit there are other hobbies that are not competitive: painting, writing, stamp collecting, soap making. None of these seem conducive to sharing and being with other people, though. I may be wrong. I do not know the inner workings of the artistic or stamp collecting community. They may have conventions and groups much like fiber artists. However, I imagine that most painters, sculptors and writers need solitude to create, or at least the ability to not be stopped when other people want to fondle their brushes/clay/pens. Over all, I think knitting is more than a hobby. It is a way to connect in a community. Having confessed my need to be alone for most of my day, I think I will enjoy the company of other knitters in this new lunchtime knitting group. I think being part of a knitting group is like being a member of an extended family. You may see them every day or you may see them only at the yearly reunion; but either way, you are still family. So, I hope I will be considered a new member of the family.